now that I’m older, and can control my squint more, I don’t need to wear them all the time. At the minute I wear a pair of Red or Dead ones just for reading or when on the computer, but I’m bored of them, and have spied these lovelies that I desperately want to get the next time I need an eye test! 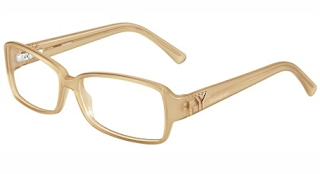 These gorgeous peach frames are Yves Saint Laurent and I’ve found them at £180.00 – ouch! Best get saving! Back later for Three for Thurs! £180 is nothing! My sister spent £300 on glasses!! So you shouldn't feel too bad.